A nurse examines a young refugee at Svyatogorsk Lavra. 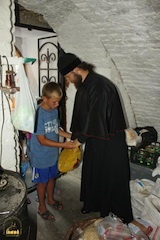 A monk gives a young refugee some provisions. Elena Lischuk is from Donetsk. “I live in a neighborhood in Donetsk near the railroad station, the same station that has come under fire several times. This is all the more frightening when you have two young children and the sky is shaking with explosions. And then I discovered that I was pregnant with my third child. It was only after the danger had passed, once I was at Lavra, that I felt a threat to my pregnancy. Thankfully, doctors come to visit us, taking turns, and provided us with everything we need. It is also good that all of us in Lavra are like one big family. The neighboring women would look after the children, and the abbess took me to the hospital, and provided me with everything I needed. Once I had undergone my treatment, I came back. The Lavra is both my protectress and the future godmother of my son. IwillcallhimIlya (Elijah)”. “In this complicated time, when our Christianity and the right to call ourselves a son or daughter of the Holy Orthodox Church is being tested by God, we thank all those who have helped and appeal to everyone not to remain indifferent, but to provide an example of mercy and love to their neighbors, asking their holy prayers for us sinners” (from the appeal of Archbishop Arseny, Deputy Abbot of Svyatogorsk Lavra). The brethren of the Lavra, thanking God and all of the benefactors, prayerfully wish that the good shown to our neighbors will be returned an hundredfold to the families of the benefactors, and that the Lord bless their good undertakings. Thank you all for helping refugees from Ukraine! Donate now to help our Church!